Corey, I can now say that I have exactly twice in my life read a book in one sitting. The first time was with IAN BANKS’ THE WASP FACTORY and the second incident occurred thanks to your autobiography COREYOGRAPHY. I was trapped in an airplane with THE WASP FACTORY but your book was so good I just went into a corner and ssshhed the world. I may need Tommy Jarvis style glasses now. I read till four in the morning and my eyeballs were way past pleading for mercy. But what can I say, it’s written in such a concise, conversational, clear-cut way that it’s an overall joy to read except for the parts that aren’t a joy to read because they are like being punched in the stomach and having your GREMLINS lunchbox stolen. I feel like I owe you an apology. Being a couple years older than you, I enjoyed your performances in eighties classics like GREMLINS, FRIDAY THE 13TH: PART 4, GOONIES and STAND BY ME and then as soon as you hit your teen phase, (think anything after THE LOST BOYS or involving the “Coreymania” phenomenon you shared with soul brother cohort COREY HAIM), I basically rolled my eyes and prayed for your quick downfall. If I had known anything of what your life was actually like and the things that you endured I would have been routing for you all the way. I’m sorry, Corey! I didn’t know! I just thought; “Hey, this person is loved, has everything they could possibly want, is enjoying their life and why can’t they fall into a manhole and die?” It wasn’t personal! Back then I condemned all human contentment that I falsely perceived due to my incalculable ignorance! Plus I was jealous! I can admit that now. Where was Lance-mania? Why didn’t I have an 800 number? Why wasn’t I invited to the Neverland Ranch? O.K., you can actually have that last one all to yourself but I would have at least liked to have had the honor of meeting Crispin Glover! Oh well, I’m older now. I realize the grass isn’t always greener and to my credit when, earlier this year, the townspeople were calling for Miley Cyrus’s head on a pike, I was actually repulsed by all the misplaced venom. I feel bad for you child stars who have to somehow find a way in this world while constantly being scrutinized and undermined by what must seem like everyone. Plus, I’m a middle child so I totally get that “one day you’re hot, the next your not” thing. But I don’t think I can ever comprehend the exploitive chomp ‘em up and spit ‘em out Hollywood machine you survived or what it’s like to have such a horrible mother. You go ahead and forgive your mother Corey, it’s best for you. I can’t do it. Blaming parents has really gone out of fashion lately but I’m a retro type of guy that believes folks should be accountable for their actions. At some point we’re all told we must get over stuff and move on but it’s usually those who stand to gain the most from collective amnesia that sing its praises the loudest. No, Corey your mother didn’t force you to do drugs but she couldn’t have programmed you to be a bigger user if she tried and she may not have molested you but she might as well have held the door open for those who did. While she was living off your income, she had one job to do which was to keep you and your siblings safe and provide you with the foundation of self worth to continue that job on your own in the future. It was a job she mostly failed at. It’s impossible to fill a bucket that has been punched full of holes and while horrible things happen to kids with the greatest of parents as well, kids treated the way you were stand little chance at all. I’d blame your Dad too if he even registered as a person. Ah jeez! This is why I have avoided writing this for so long! I knew it would get me up on a soapbox because this book, good as it is, outraged me to no end and I have to mourn the fact I’ll never watch FRIDAY THE 13TH: PART 4 the same way again! In closing, wonderful job on the book! What a brave and impressive achievement! I’m so sorry that you went through what you did but thanks for sharing your story because it will not only open eyes like mine but also allow others who have suffered in the same ways feel less alone. My sincere condolences on the loss of your friend Corey Haim, the one person who needed no help understanding your experience. I think you are absolutely correct in surmising his drug problems were a direct result of his abuse and I guess, from now on, I will not be so quick to judge those with substance problems. I hope the rest of your life is a breeze and know that even more amazing than the accomplishment of this book is the accomplishment of breaking the chain of abuse and becoming the parent that you yourself deserved. Oh, and thanks for narrating the CRYSTAL LAKE MEMORIES documentary! That was really cool! Keep on keeping on and “Goonies never say die”! Great letter! Now I want to read this book. Corey should pay you for promoting him! Thanks! You really should check out this book! It’s truly fascinating and shows you a side of the eighties that rarely gets seen. And Corey doesn’t have to pay me anything to promote it! He’s paid enough! 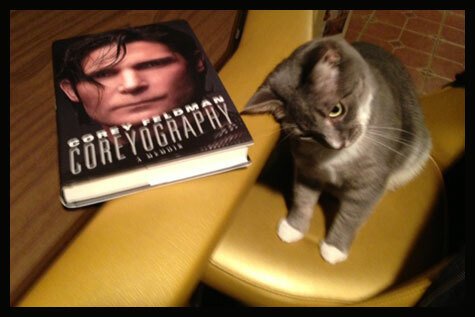 I never thought I’d be saying this, but after that review, I’m really looking forward to reading about the life of Corey Feldman. I have an undying, unashamed love for Corey Feldman (and Corey Haim), whom I’ve always rooted for. I didn’t know he had a book out, and I plan to go order it right now.